You cannot visit Bacolod City without trying chicken inasal. The dish is so linked to the city that there is a whole row of restaurants devoted to it, aptly called Manukan Country (chicken country). I don’t know Manokan Country’s exact address. I don’t know the contact numbers of any of the inasal establishments that comprise it. My friend and I found it by getting into a cab and telling the driver where we were headed. The common saying is that “Everything in Bacolod is five minutes away.” The city is small, and almost everyone knows where any place you are looking for is. True enough, it took about five minutes to get from the hotel to Manukan Country. On the way, we asked the driver which restaurant he thought was best. He gave us two answers: Aida’s and Nena’s, though he said that he preferred Aida’s. So that’s where we went. Aida’s actually has a Manila branch located in Makati Cinema Square. 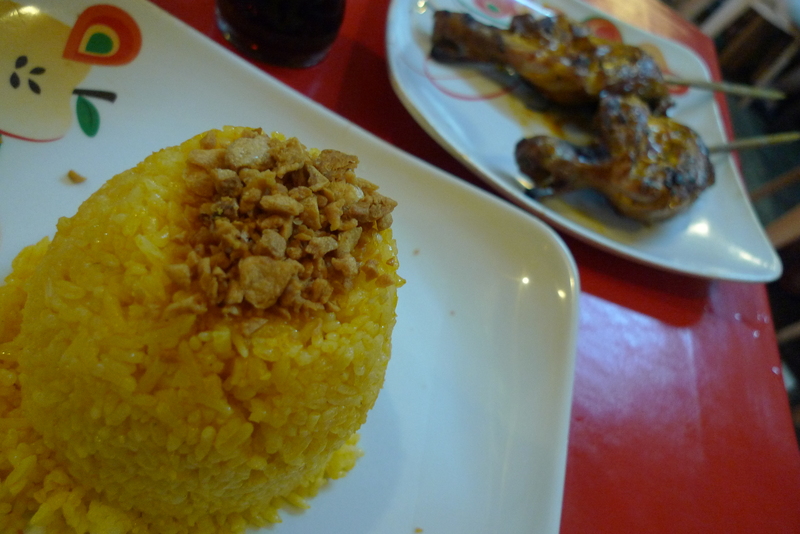 People who have eaten there will tell you that it is one of–if not the–best chicken inasal places in Metro Manila. We knew this, but wanted to try the original branch anyway. My friend and I ordered the same thing: one paa (thigh, as opposed to the more popular pecho) and regular Coke each, and one rice to share between us. When the orders arrived, we proceeded to eat with our hands. 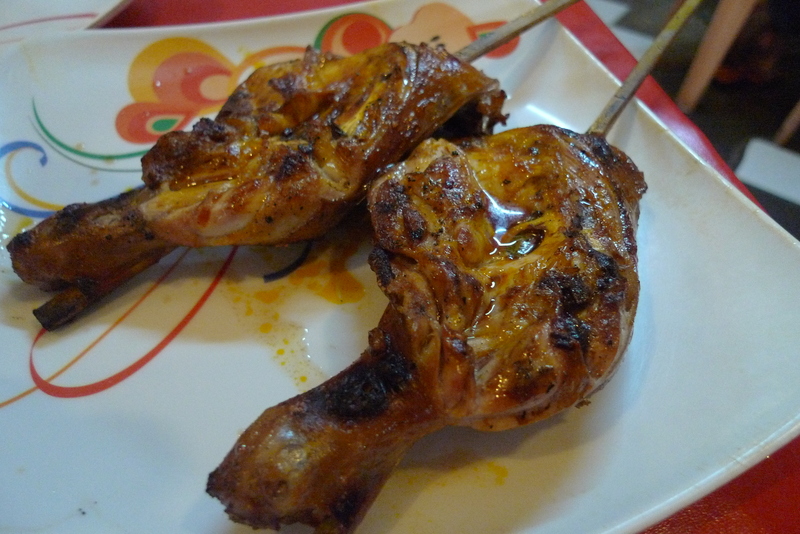 One of the best parts about eating chicken inasal, I believe, is eating it with your hands. You tear the chicken apart with your fingers, dip it in sauce which you have prepared yourself which may or may not be composed of sili (bird’s eye chili), calamansi, vinegar and soy sauce. 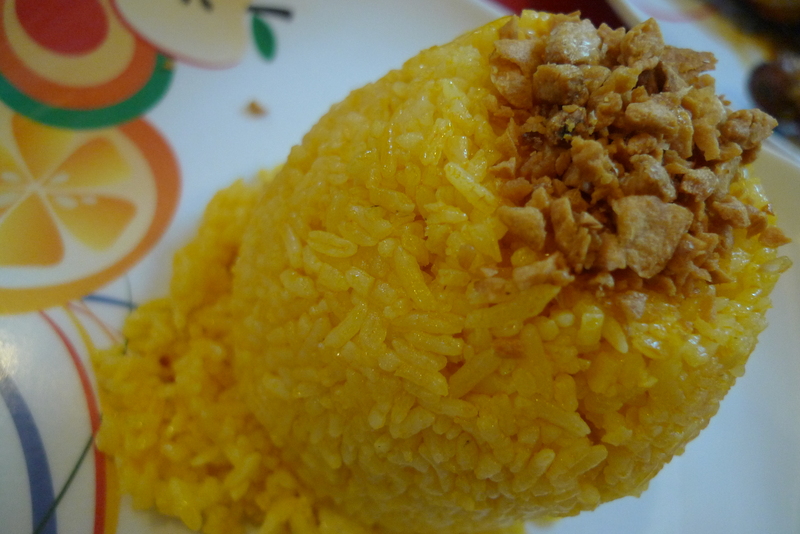 The chicken is eaten with rice, pinched with the dominant hand from the steaming mound topped with garlic and covered in chicken oil from the bottle found on the table. The chicken is soft, laced with a smokey, buttery flavor. There is great pride taken in the inasal marinade, with each restaurant, or family, adding their own spin to the basic recipe. I have been told that the best ones contain a certain brand of margarine. Rice from Aida's--right before it gets drowned in chicken oil. There is plain soup, as much as you want, to accompany the meal and warm the stomach, or if you are so inclined, to wet the rice. I also believe that the drink that goes best with chicken inasal–with almost any Filipino rice dish, actually–is regular Coke. Not Coke Light, not Coke Zero, not Sprite, not Royal, not Pepsi. Regular Coke. And no, I’m not a brand endorser (though my email address is on the website, just in case the good people from Coca Cola wish to remedy this), I just really think that it goes well with Filipino food. The meal is finished when the chicken is picked clean, the bones almost gleaming; when there isn’t a morsel of rice left, the last grain licked off the side of your hand. There are ample washing stations equipped with strong, flowing water and enough soap to wash away the oil and grease from your hands, but not enough to wash away the faint smell of smoke and chicken, the souvenir that you take home, one that washes slowly away as the day or night goes on.